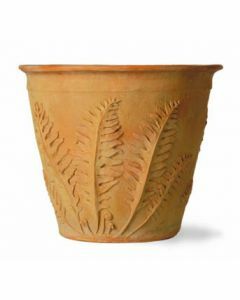 Maintenance free, tough, light weight, completely frost proof and non-corrosive... this fiberglass and resin planter is a serious long term alternative to true terracotta. Ideal for use inside and out. The planter is available in four different sizes. The small measures 14.2" in diameter X 11.4"H, the medium is 17.7" in diameter X 15.4"H, the second medium size is 22.1" in diameter X 18.1"H and the large is 26.4" in diameter X 23.6"H. Please choose the size from the drop down menu. Click on image for greater detail.